Ice the cake with white icing using a cake spatula and making sure the surface is smooth. Using parchment paper, cut a piece that is as big as the cake top. Cut a rectangle out of the center the size that you want the rainbow to be. With food color sprays (also known as color mist), spray strips of rainbow, one at a time, in the center that you cut out from the parchment paper. Lift the parchment border off. On the remaining white top edge and sides of the cake do lace work as shown in the picture using round tip, size #5 and white icing. With star tip, size #18, make a shell border along the inside and outside edge of the lace work border and the bottom edge of the sides of the cake. I bought a small china doll and placed her on the cake top burying the base of the ballerina doll stand in the cake. These dolls can be purchased in most craft stores. With round tip, size #15, write the birthday message on the cake board in white icing. This is a very easy cake to make that is sure to delight any little girl who love's ballet. Obviously you can also make this cake with a different theme by replacing the ballet themed doll with another doll such as a gymnastis doll or any other type of doll. Browse below for some more cakes that any little ballerina is sure to love. If you have made a Ballerina cake for a birthday or other occasion that you would like to share, please submit your cake here and let us know how you made it! We would love to feature your cake on our site. Please make sure to include a photo of your cake and a description of how you made it, so that we can all share ideas and learn from each other! 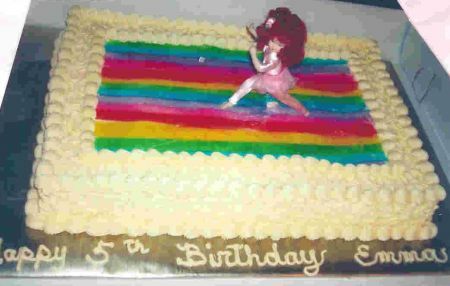 See Ballerina Cakes That Were Submitted By Others To This Site!